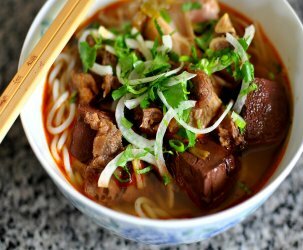 From the perspective of a casual visitor, it seems that the pitter-patter of rainfall whets the appetite of Nor Cal food lovers. 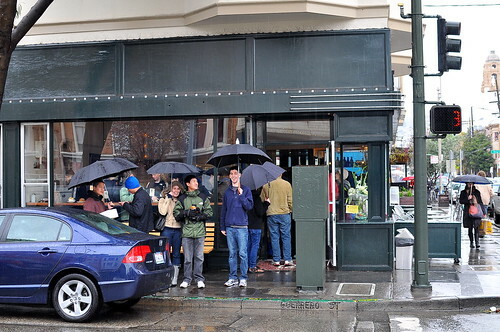 In spite of inclement weather, hungry hoards were lined up outside Homeroom in Oakland, and once again at Tartine Bakery & Cafe in San Francisco. I’m one of those wussy So Cal-types known to cancel dinner reservations whenever a storm approaches, so I was especially impressed to witness such sheer determination. When The Astronomer and I arrived on the Tartine scene, we were greeted by a line fifteen deep snaking out the bakery’s door and into the rain. Seeing these dedicated folks waiting so patiently got us even more excited to sample the breads and pastries of Elisabeth Prueitt and Chad Robertson. The husband and wife duo opened Tartine in 2002 after graduating from the CIA and training extensively in France. 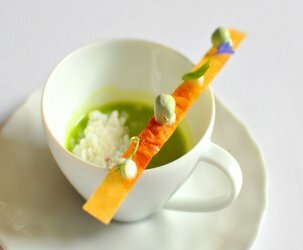 In 2008, the couple was awarded with Outstanding Pastry Chefs honors by the James Beard Foundation. Joining us for lunch were my cousins Timmy, Michael, and Andrew, and Timmy’s girlfriend Jessica. Our friend A.J. rounded out our party of seven. Since our group was humongous by Tartine standards, we congregated along the bar overlooking the sidewalk. A comfy table was definitely not in the cards. Nearly everyone in our group ordered one savory and one sweet item from the concise menu. 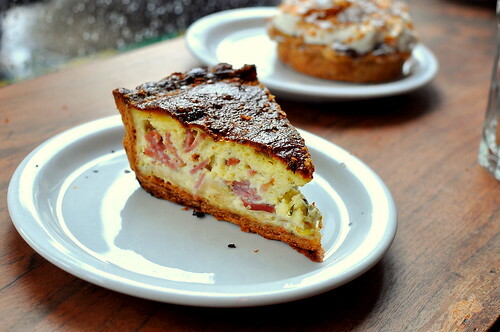 I went with a slice of quiche ($4.75) made with crème fraiche and Niman Ranch smoked ham. The texture of the egg had a gentle quality about it, while the crust was sturdy and buttery. Had it been served hot out of the oven (and with hot sauce on the side), I would’ve been more enamored. The Astronomer’s croque monsieur ($9.75), on the other hand, was warmed in the oven just before serving and arrived perfectly toasty. 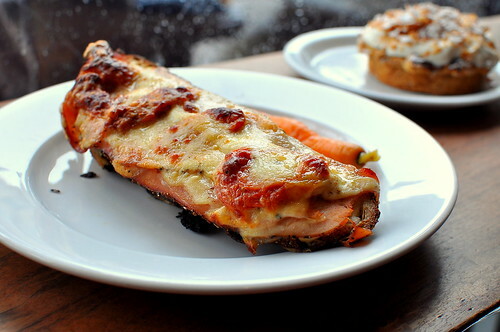 The open-face sandwich was layered with béchamel, gruyere, thyme, pepper, and Niman Ranch ham. While the toppings were all superb, it was the bread base, which was baked in a wood-fired oven, that really stood out. That, and the spicy pickled carrot served on the side. A.J. ordered the prosciutto, arugula, and provolone sandwich ($13), and generously shared a portion with The Astronomer and me. As was the case with the croque monsieur, the filling was great but the bread totally stole the show. For the sweet portion of my meal, I selected a gorgeous coconut cream tart ($6.50) from the bakery display. The base was a flaky pastry coated in dark chocolate, while the filling was one part pastry cream and one part lightly sweetened cream. The entire creation was topped with slivered almonds, toasted coconut, and powdered sugar. The tart took my taste buds to a sunny and happy place. Timmy and his gal shared an eclair ($4.95) filled with vanilla custard and coated in a thick Valrhona glaze. I stole a bite and loved the intensity of the chocolate coupled with the velvety custard filling. The Astronomer’s brioche bread pudding with apples ($6) was served at room temperature. By the time we finished up our savories, the dish had grown unappealingly cold. 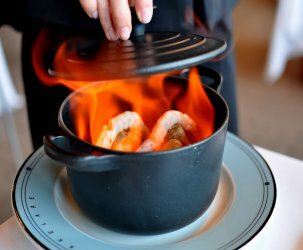 We asked the folks behind the counter to reheat our pudding, but they couldn’t swing it. Instead, we packed it home and enjoyed it several days later. It was a fine bread pudding, but probably would’ve tasted worlds more memorable had we eaten it warm on the day it was made. Andrew took a forkful of his lemon meringue cake before I could steal a shot, but I didn’t really mind after seeing the look of immense satisfaction on his face. 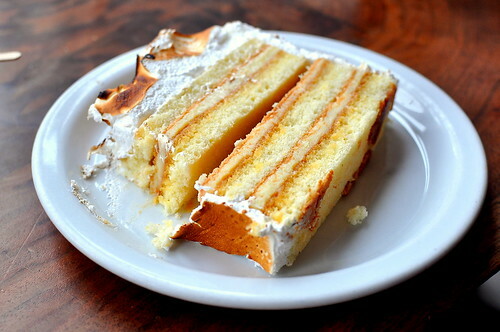 The beauteous slice was made with lemon-moistened genoise layered with caramel and lemon cream. It was topped with torched peaks of meringue. Andrew kindly offered me a taste, but I refused because I got the sense that he wanted the cake all to himself. It was that good. 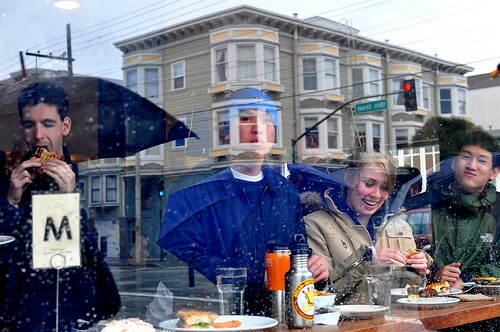 Gray skies and cold rain usually get me down, but spending the afternoon in Tartine with friends and family, I adopted the Nor Cal spirit and ate and laughed with glee. This was one of my most favorite places when I visited SF for the first time. I still remember what I had: freshly squeezed OJ and warm croissant w/chocolate. I love the morning buns here…but they sell out pretty quickly. Okay you and the @ravenouscouple have convinced me to brave the lines next time I am up in the Bay Area. I love love love Tartine. 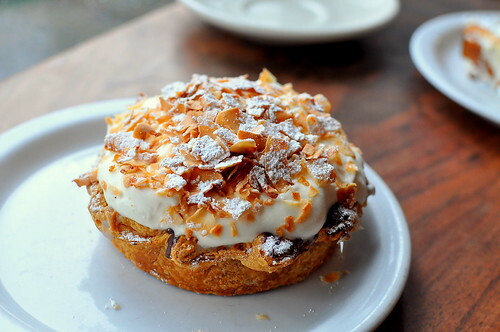 Even though I go to a lot of bakeries (I say it’s a sacrifice for my blog food reviews), Tartine is something special. The lines can be brutal, so if you’re flexible, then scoot down the street to BiRite Creamery where you will have the best Toasted Coconut or Salted Caramel ice cream you could possibly lay your hands on. 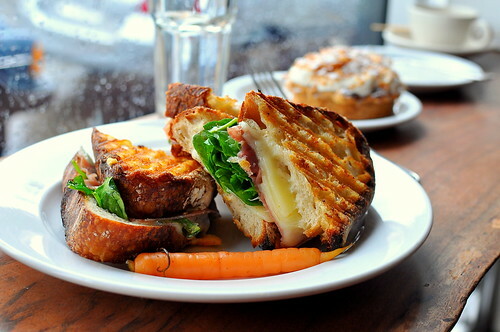 Wow that croque monsieur does look fabulous! Not too heavy like so many versions! 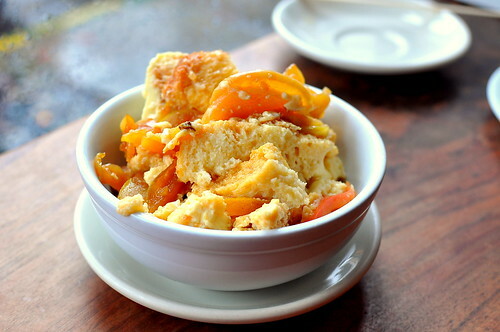 A bummer about the temperature of your quiche and the bread pudding — what a brilliant waste of fine carb calories! Sam Kim just told me they have a knock-out lemon bar… even better than my beloved one from Joan’s on Third. Seven people at Tartine? You are brave. I should have cautioned you to eat the pudding as soon as it came out. That coconut must have been divine. Glad you had such a great trip. The dishes look tasty. Love your photo’s too. The only thing better than croque monsieur is a croque madame. Those sammies top the list. Your’s looks super cheesey and toasty. Wow, everything looks so good, but isn’t it funny that the bread – one of most commonplace foods – was the real star? I have no doubt that their attention to detail when making their hearth breads really pays off. Plus that coconut tart looks divine! Nice post. Really enjoyed the read. That Astronomer is the greatest idea I’ve almost ever heard. So going to attempt that at home. That toasted coconut makes that cake look incredible. I’m definitely going to toast mine to this degree next time I make my key lime coconut cheesecake. Thanks. Definitely pick up a morning bun. Love those guys! Tartine was just as fabulous as everyone was telling me! I almost went for the tart as well but chose the tres leches instead! That was delicious as well! One of my fav bakeries. There are so many items to try, thanks for sharing. What would be your favs on previous visits? Ann – This was my first visit to Tartine! I shall be back 🙂 My friends love the croissants! Ohh I am so jealous, I want to fly to San Francisco right now ! But instead I’ll just pull out the cookbook and see what I can make that looks half as delicious as your photos ! 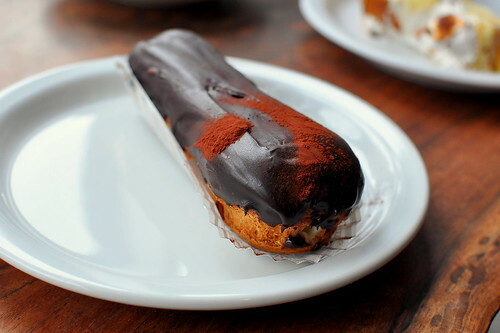 That eclair looks amazing! I’ve always wanted to check out tartine. Yum! When are you coming to Portland? next time get a slice of olive cake. black olives, gruyere and ham. and their ham and cheese croissants are divine as well. awesome! I agree. The croissants are good and the size is large. Their tres leches cake was featured on a Food Network show. I LOVE this place. I hate waiting for a table, but it’s worth it!! Morning buns are the bomb! Get the Morning Bun next time, but the bread pudding here was my favorite. It’s a shame you weren’t able to enjoy it there. Re: Coconut Cream Tart. This is a fabulous dessert, though the crust is more than hard. I visited Tartine twice during my week-long visit to SF, and both times the shell on this dessert took a ridiculous effort to cut through, either by tooth or utensil.